Perry, Bush, Josh Brolin, or Will Ferrell? Take Our Audio Quiz to Guess Who’s Talking! Rick Perry has been making a lot of waves on the campaign trail since his formal announcement last Saturday, but he possesses at least one startling quality that he soon may end up wanting to live down: He sounds a lot like the last Texas governor to reach the White House—George W. Bush. Don't believe us? Then try our game of "Who said it?," in which we found both pols (and some impersonators) who all sound pretty darn similar to Dubya. 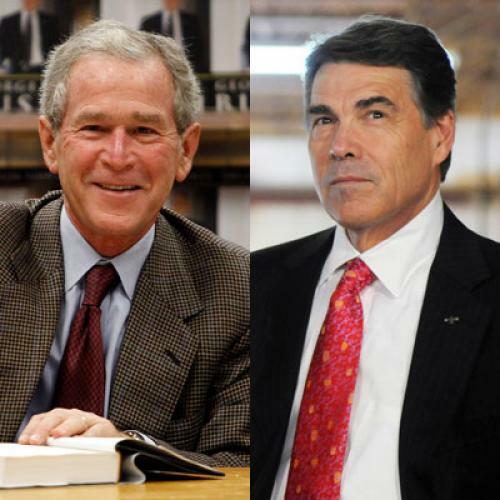 (The possible options are Will Ferrell, Rick Perry, Josh Brolin, and Bush himself.) See if you can distinguish 'em: it's a lot harder than you might expect. Answers on the next page.